A woodworker whose passion is to search the countryside for a special one-of-a-kind, piece of timber, be it cherry (a favorite), maple, walnut or cocobolo, that has enduring character and turn it into a finely engineered and ultimately beautiful piece of furniture, so unique it is considered a work of art. Gary’s technique tends to be influenced by methods and styles of earlier times, using antique woodworking tools and skills (although he does use a bandsaw from time to time). Other influences: ancient Japanese joinery, “Shaker-style furniture, Colonial-style furniture, Early American hand tool techniques and a natural finish look. Moving to Whidbey Island in 2000 proved to be even more tempting for Gary to expand his horizons and express his artistic talent. In pursuit of his passion, he spends hours (and hours and hours – just ask Sandy) dreaming up ideas, finding that perfect piece of timber and finally creating a true work of art. Gary’s labors of love demonstrate his creativity as a contemporary artist and his woodworking skills. 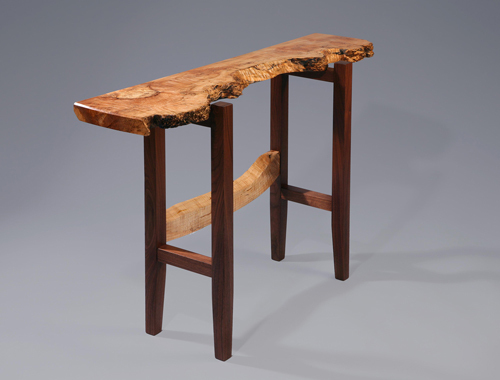 The basis for this piece of wood art began with the discovery of the magnificent old slab of highly figured black cherry (Prunus serotina) crotch sourced from Pennsylvania. This large slab was cut to create the bookmatched tabletop. Properly aged, crafted and finished black cherry timber rivals any other wood in the world for its stability, durability, pattern, exceptional chatoyance (opalescence reminiscent of looking into a cat’s eye) and deep patina that will develop over time. Although the bark has been removed the natural curved edge has been left. The graceful curves across the ends provide a pleasing balance with the longer sides while visually tying the top form to the base. The geometry of the tabletop curves continues downward through the surfaces of the apron and lower end spreaders, all of which are curved and under-arched as well. The flat surface of the tabletop, lower end-to-end spreader and straight legs provide a striking contrast to the numerous curved surfaces. Adjustable felt feet allow the table to sit flat and level on uneven floors. Black cherry has also been utilized for the butterfly keys used to artistically, as well as structurally, tie the two top slabs together. The success of the overall design depends upon precise hand-chiseled blind mortise-and-tenon joints (Japanese jigoku-kusabi joinery technique) for permanent attachment of all frame pieces to create a table that will last for generations. ​The table has been hand finished with a durable satin lacquer to highlight the natural color and protect the beautiful character of the cherry timbers while giving the table a warm feeling to the touch. As with all of his wood art pieces the title of the piece, creation date and artist information has been permanently stamped on the underside of the piece.